The flume is a simplification of the design presented by de Haas et al. 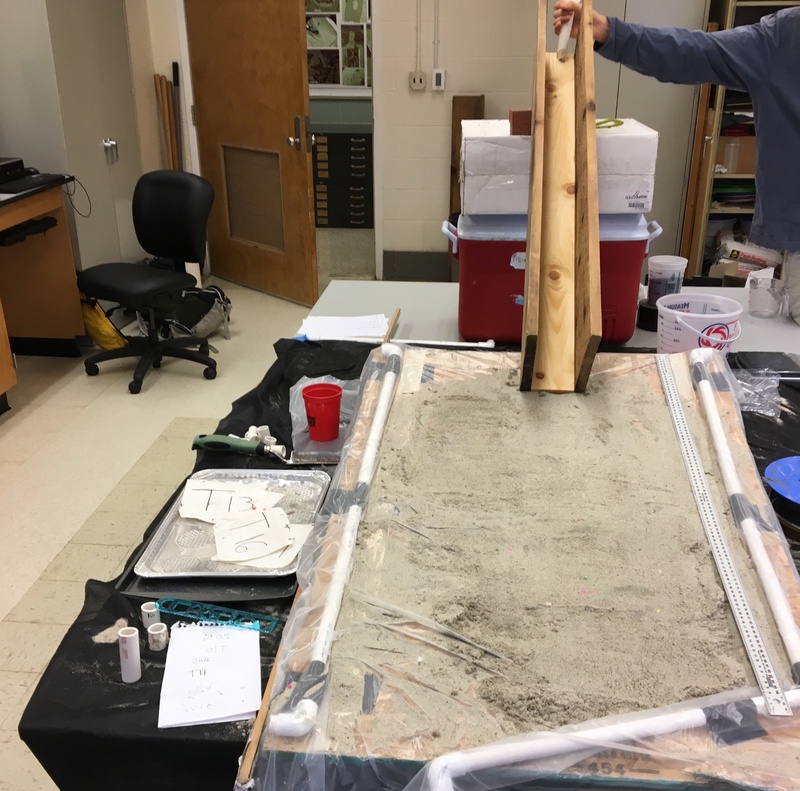 (2015), who measured sediment sorting and debris flow runout in a scaled down setting. A wooden, rectangular flume that is constructed from three pieces of lumber. Total flume dimensions are 122 cm long, 9.5 cm wide, with 11.5 cm tall channel walls. The flume is set at a 30º angle. An ‘outwash plain’ that is a piece of plywood (in this case, 100 cm long, 75 cm wide). Several lengths of pvc piping are taped to the edges of the plywood to prevent spillover. The entire surface of the ‘outwash plain’ is overlain by plastic (painter’s) dropcloth. The plastic surface is in turn covered with a ~1 cm thick layer of dry fine/medium sand. 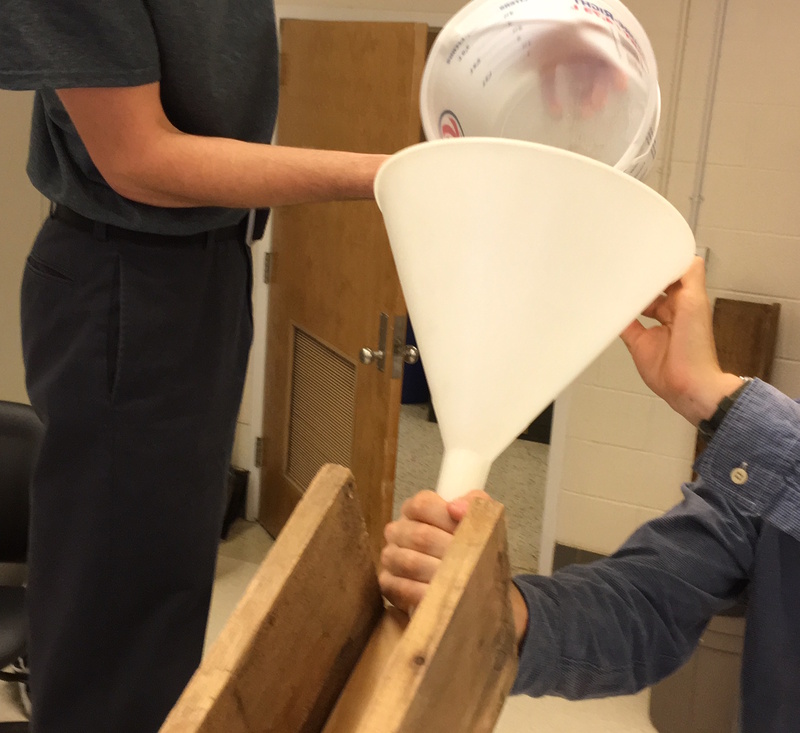 The outwash plain is set at a 10º angle, and empties into a 5 gallon bucket. A smaller bucket is used to manually mix the debris flow mixture (sand, gravel, water) using a swirling motion. The bucket is then manually dumped into a 25 cm radius funnel with a ~2 cm opening at the bottom. This funnel empties into the top of the flume channel. Here is a slow motion video of the debris flow runout. 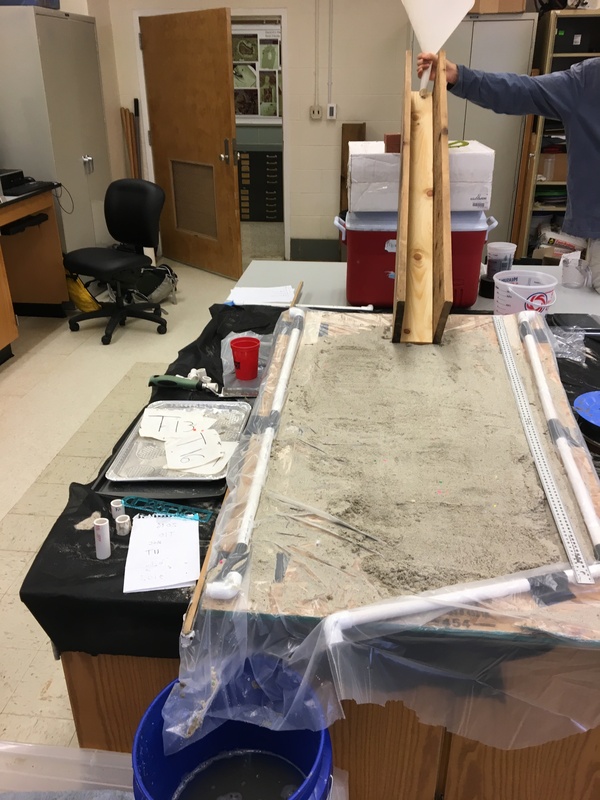 (the debris flow in the video is composed of fine/medium sand, multicolor aquarium gravel, and water).